For daily use: We recommend taking 1 to 2 capsules per day so that the natural ingredients can continue to provide long-term mood support and emotional harmony. 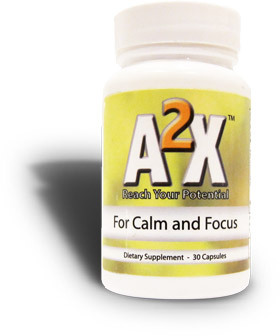 For emergency use: If you prefer to take A2X only at the onset of an anxiety or panic attack, we recommend taking 2 to 4 capsules as need for maximum relief. For anxious days: We recommend taking A2X when you wake up in the morning so that the natural ingredients can provide their calming effects throughout the day. For sleepless nights: We recommend taking A2X soon before you get ready for bed so that the natural ingredients can help quiet your mind for a good night’s sleep. You may take A2X with or without food. Keep in mind that although A2X may be taken with food, it may take longer for the nutrients in A2X to be absorbed into your system.